It was a dark and stormy afternoon. Which was odd, because the rest of the day, and most of the previous two days, it had been sunny and quite warm. At first it started to rain lightly. I took my rain jacket out of my backpack to cover myself, put a pack cover over my backpack, and continued on with my walking. I had just left the Les Fromages de l’Îsle d’Orléans, tasting several delicious types of locally made cheese, along with some grapes and crackers, which made a delicious snack. A few moments later, it began to rain harder. I took shelter under a tree to put on my rain pants, and to protect my camera and cell phone. I then set out for the last few miles of my 10 miles of walking for the day. Sneaking in a few pictures in between the rain drops of a roadside cross, one of several scattered throughout the island, the rain began to pour harder, coming down in buckets. Hiding my camera once again, I saw an open barn of a farm and took shelter, along with two bicyclists. All of us hoping that the rain would lighten up. We waited. And waited. And waited. I knew I didn’t have much further to go on my walk that day, and since I was walking the entire 42-mile Chemin Royal, the road that encircles Île d’Orléans, an island near Quebec City, Canada, I didn’t want to miss a single step. So I decided to stick it out, and kept on walking. Even with the rain that felt like I was now under a waterfall. And then it began. The thunder. And lightning. Ok, I thought, not much further now. I can handle this. I persisted on until I saw one of the dozens of food specialty shops on the island. For some relief from the rain, I took shelter in La Halte des Anges, a shop that sells pies, jams, and jellies prepared from fresh local strawberries. This reminded me of all the fresh fruits and vegetables grown on the island that I had been experiencing during my days walking, available to purchase at roadside stands, pick-your-own, or created into so many delectable products. La Halte des Anges also sold lavender products also made on the island. I could smell the aroma, just as I had smelled earlier that day, as I had walked amongst a 10-acre garden of lavender, with 75,000 lavender plants at Seigneurie de l’île d’Orléans. Ironic that the loose translation of the name La Halte des Anges is “The Stopping Place of Angels.” Just what I needed, some guardian angels watching over me as the rain, thunder, and lightning would not let up. It was getting to be near 5:00 now, and the shop was closing. So once again, I trudged on. Not wanting to miss a single step. But the thunder and lightning struck again. And again. And again. I began counting the seconds in between, remembering from my childhood that the fewer the seconds in between, the closer the storm. Three seconds. Two seconds. One second! Too close for comfort. Now what do I do? Although I knew I was close to my destination for the evening, I really didn’t exactly know how much further. A mile? A half a mile? I stuck my thumb out hoping to hitch a ride. No luck. Then I saw a home. 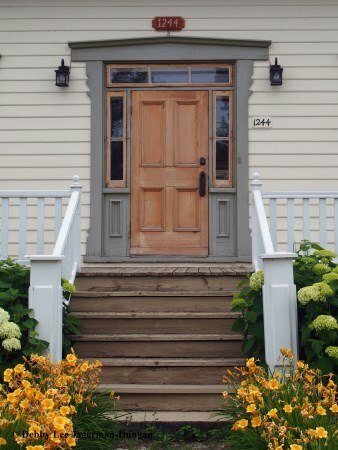 A home with a porch. A porch similar to the ones that I had been photographing dozens, no hundreds, of times during my walk around Île d’Orléans. 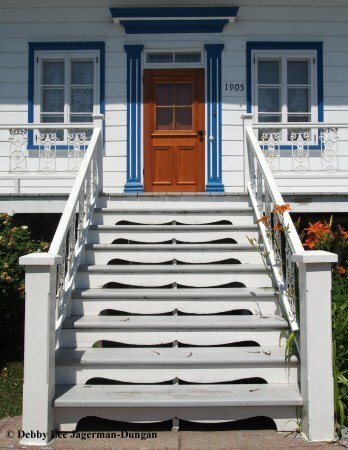 A grand, inviting, hospitable porch, like the ones I just published in my book, “The Porches of Île d’Orléans: Seeing the Island through its Windows and Doors while Walking Chemin Royal.” (Available on Amazon.) 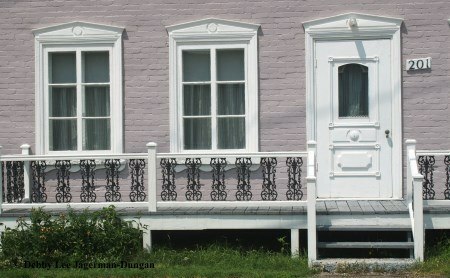 Part of my journey around the island, aside from visiting as many of its forty food specialty shops and restaurants, bakeries, wineries, chocolateries, and twenty arts and crafts boutiques and galleries as I could, was also taking photographs of windows and doors, my favorite subject when I travel. This island has a 350-year old New France history, culture, religion, and architecture. 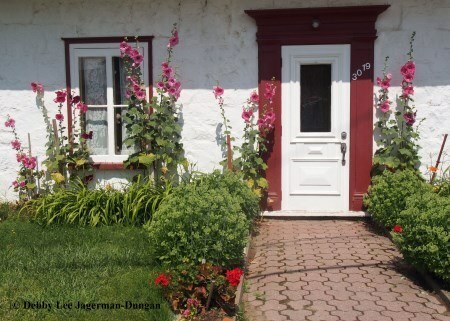 With many homes built in the 19th, 18th, even 17th centuries, based on this New France architectural style, and some in a Québécois style, they included porches. But this porch was a bit different. It was shelter, once again. I ran under it, dripping, no sopping wet. Not really minding that I myself was wet, but more trying to protect my camera and cell phone, even with it being protected already. I sat on a chair that was under the porch. I began to dream of the locally made double chocolate and hazelnut-chocolate ice creams I had earlier in the day at the Chocolaterie de l’Île d’Orléans. Trying to figure out what to do next, in between the loud thunder, trying to think, decide. I could no longer see the fields and crops of the farmland landscape of the island. I could no longer see the mountains of Québec Province in the background, or the waters of the Saint Lawrence River surrounding the island. Île d’Orléans is an island where there are no fences between the homes and farms, where people leave their clothes hanging out on lines to dry in the fresh air. It is an island with 600 historic buildings and monuments, including parish churches and chapels. I had to breathe. I decided to call the bed and breakfast that I was staying at that night, to see if they could come pick me up. I dialed, she answered. But the sound of the thunder was too loud. She could not hear me. The connection was bad. I hung up and tried again. Nope, same thing. She could not understand my need for a ride. I sat hoping the rain, and thunder, and lightning would stop. Nope. No such luck. The thunder. The lightning. Right there. I have never been caught in a storm such as this, even in all my walking travels. Even in all my hiking and backpacking trips in the mountains. Finally, noticing the garage and the car next to the porch that I was taking shelter under, I thought, aha! Perhaps the people who live in this home could take me to where I wanted to go. I knocked. On the door. A man answered. And his wife in the background. Yes! I thought. But alas, as I rattled my story to them in English, dripping wet…I’m-walking-the-island-I-have-no-bicycle-no-car-it-is-raining-no-it-is-pouring-it-is-thundering-and-lightning-and-I-am-hoping-you-could-please-give-me-a-ride-to-my-bed-and-breakfast…they looked at me like I was crazy. Well, not that I was crazy, but they just didn’t understand. They only spoke French. So I began to use my best sign language, a language hopefully that we shared in common. As the thunder and lightening struck, and startled us all, I gestured out and pointed to the rain. They knew that. I pointed to my dripping self. They saw that. I used my index and middle finger, pointing downwards, moving side by side, to indicate walking. They seemed to get that. I pointed to their car, and used my arms and fists rotating to symbolize driving. They got that! And I pointed to the name of the bed and breakfast on my itinerary. Yes, he understood! I was rescued from the storm! The kind gentleman went to get his keys and his rain jacket, and drove me, what turned out to be no more than a half mile to my bed and breakfast. I thanked him as best I could. Merci beaucoup! Merci beaucoup! Merci beaucoup! A thousand times. 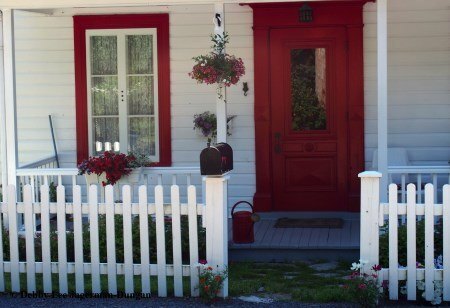 The next morning, the woman at the bed and breakfast kindly drove me back to that home with the grand, inviting, hospitable porch that I took shelter under, so that I could begin my walk from where I left off, in the warm sun, on my final day of walking around the 42-mile road encircling Île d’Orléans. So as not to miss a single step, so that I could resume exploring all that this island has to offer, and so that I could continue taking pictures of the grand, inviting, hospitable porches. 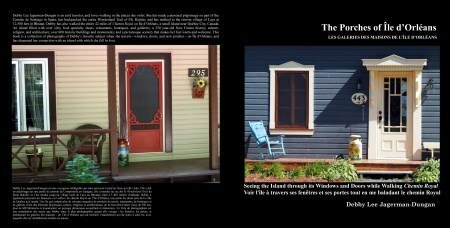 “The Porches of Île d’Orléans: Seeing the Island through its Windows and Doors while Walking Chemin Royal” is my travel photography book that contains over 100 pictures of the windows, doors, and porches of the island. I even found a website that told me the year of construction of many of the homes, and I have included these years in the book. 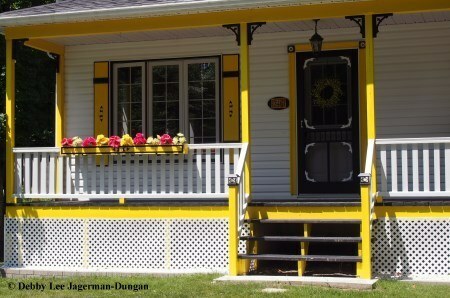 For example, homes that were built in 1920, 1900, 1890, 1865, 1777, 1700, and earlier. The book is in both English and French. Available on Amazon. 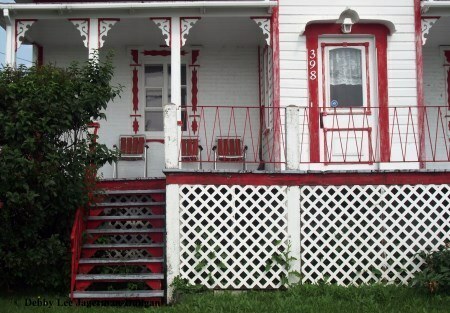 By the way, for privacy purposes, I have not included a picture the porch that I took shelter under in this blog. It is in the book though, but not identified. Inspired from my walk around the 42-mile Chemin Royal, as well as from a song written by a French-Canadian singer-songwriter, Félix Leclerc, where he describes Île d’Orléans as “42 miles of quiet things,” I came up with “42 Reasons to Visit Île d’Orléans.” And a “Travel Guide to Île d’Orléans,” and “Tips for Walking Île d’Orléans” to assist you with your journey to the island. Beautiful! I can tell the island residents love color. It almost reminds me of the colorful home colors in places like Ireland. Kristin, yes the colors were quite varied, and unique. What a “page turner” of a blog! I didn’t know this! Did u tell Mom? What a nice couple! Thanks, Nancy! Yes, mom knew, but I can’t remember exactly when I told her. She definitely knew as I was writing this blog, and loved the story! And, yes, that couple was very kind to drive a total stranger in a thunderstorm. Realicé dos visitas a la hermosa isla de Orleans, en 2010 y en 2013, recorriendo el Chemin Royal, y disfrutando la bella arquitectura antigua de la isla, donde siempre se destacan los portales. Humberto, my apologies, but since my Spanish is not that fluent, I used an online translator to translate what you wrote. I am glad you made two visits to this island, and enjoyed the architecture of the island. Gracias. My ancestors were one of the families to pioneer the Ile d’Orleans. Since you were able to get the year some homes were built, were you also able to get family history on them? I haven’t visited the island yet, but plan to spend ample time there when I can. That is so very cool that your ancestors are part of the history of Ile d’Orleans! Unfortunately, I was not able to get family history on the homes. I actually thought of this idea, but that would have been quite an undertaking. Needless to say, getting the years on many of the homes was awesome enough!